So just one week in to March Madness, and my bracket is toast. Absolute toast. One small consolidation is that I’m definitely not alone. It was a wild weekend. So now what? There are “consolation brackets” I could get in on, but basketball is not really one of my strong points, and I join bracket challenges mainly for the fun of doing it with friends, so not sure I’ll do much better at the consolation level either. I’ve decided to stick to my strengths, NX, and create my own “bracket challenge”. And when I say “bracket”, I mean it literally: “bracket”. I’ve dug back through many of my old archives, and found various “brackets” that have been designed, analyzed or modeled with NX. I’ve listed some here, along with a short description of what they are and why I think they make my own “Elite Eight”. But I’ve left them unseeded. Chime in and let us know how you’d rank these. You may remember your first encounter with NX. If you were like most users these days, you were already familiar with CAD concepts, at least 2D if not 3D. Gone are the days when people learning NX and other CAD tools were brand new to concept, and coming from 2D drafting with paper and pencil. So gone too, are the days of needing learn all of the 3D CAD basics from scratch. That’s the purpose of the “NX Fast Start” series of lessons available in the Siemens PLM Learning Advantage system. The lessons leverage your knowledge of your old CAD system to map your current product design processes to NX. Users learn to recognize similarities and differences between the two programs as well methods to migrate your existing data to NX. It is very common to start a new design based on an old one. In some cases, you start with a model you built yourself in NX and understand very well how it was designed and can easily make a few edit to sketches, parameters, and features to achieve the desired new design. In other cases, you have to start with a design someone else built, possibly in a different system, and which was provided only as STEP, JT, or other BREP format. You have no features or parameters, only geometry. Maybe you do have someone else’s NX part with features, but you do not understand how the other person modeled it and don’t have the time to “learn it”, and just want to “move” the existing geometry. Or perhaps you might be in the middle of design review meeting with executives and need to make a quick-and-dirty “what if” change, with the intent to go back and refine the parametric model later. NX Synchronous Technology commands can help with all of those scenarios. You can directly move and delete faces, modify blends that were not created with the blend command, copy geometry from another feature, etc… quickly, without need for, or knowledge of, existing design history. The commands are remembered in the part history, so you can modify, delete, or move the Synchronous features as need, or even delete the parameters if you want to return to a “history-less” representation of your new part. It’s like having the best of both worlds. The new shapes that can manufactured using Additive Manufacturing (AM) techniques can be mind-blowing. Shapes no engineer would conceive of using traditional design methods, yet are optimal in many ways as being the strongest, lightest shape nature can create for a given set of loading conditions. But running through all this infinite number of possibilities is impossible to do manually, nor would you be sure you had the optimal design. So rather than try to do it yourself, why not let NX do the hard work for you..
Topology Optimization for Designers is a new approach to optimizing the topology within the given design space and uses CAE techniques in the background, so does not require deep CAE expertise by the Designer. It focuses on the Functional Requirements of the design and results are returned quickly in the form of highly smoothed Convergent Modeling™ technology results ready for AM printing, or guidance for re-design. Additive Manufacturing is rapidly becoming mainstream, and many of the tried-and-true design approaches and rules-of-thumb that engineers used to reference no longer hold true. Engineers now have all sorts of new possibilities available to them. So how can designers quickly learn to correctly use these new methods? They need a CAD tool that help them learn this new design world. That could mean using automated tools like the Topology Optimization mentioned in another Bracket entrant, or it could mean using new manual design methods aimed at taking advantage of AM methods. But either way, the designer needs to be sure these new designs are able to manufacturing with their new AM facilities. NX offers validation tools to analyze the part, including minimum wall thickness, printable volume and overhung regions that will need support during 3D printing. Sometimes you prefer to take baby steps towards new technologies before jumping in with both feet. NX can help there. 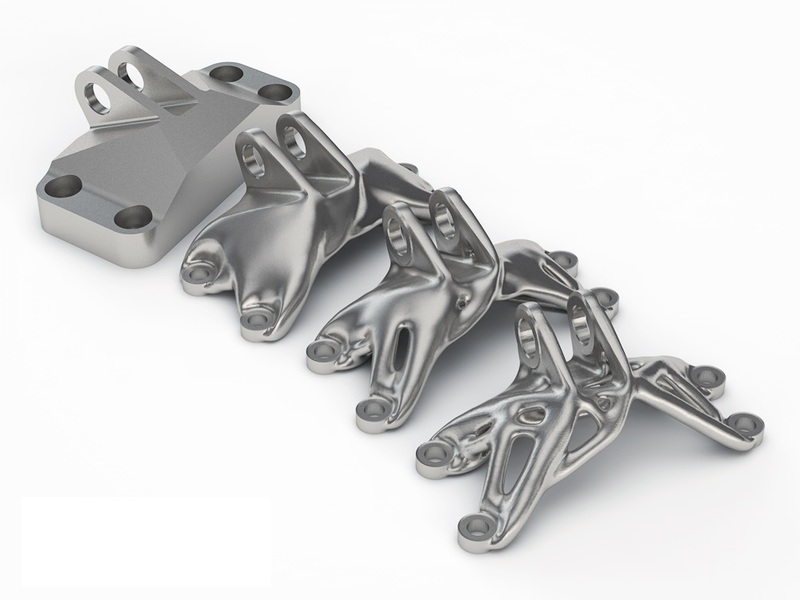 You may not be ready to completely re-design all of your parts to take advantage of Topology Optimization or the latest Additive Manufacturing capabilities to create organic shapes, but you could still start by modifying a traditional design to take advantage of the light-weighting capabilities offered by Additive Manufacturing. Convergent modeling in NX allows users to seamlessly mix facet and precise modeling in a single environment. One example of this is a medical bracket, developed using tradition CAD methods in NX. It needs to be mated to a bone that is represented by a faceted Convergent Body, based on a real-world scan. In this case, NX allows you to use the Convergent Body as the Tool in a Subtract operation, removing material from the precise CAD representation. No need for tedious or time-consuming Reverse Engineering operations to create a precise representation of the bone shape. Convergent modeling is powering in NX not just because of the seamless interaction between the precise and facets worlds, but it also allows powerful facet-based operations to be done directly on the Convergent Body as well. In this case we start with another bracket that has been created using Topology Optimization and has a very organic shape, which lends itself well to Additive Manufacturing methods. However, there are areas that we want to clean up first. For example, near the top of the bracket have “sharp edge” in the organically shape where it mates to another part. To avoid stress concentrations in operation or accidental breakage during handling, I might want to smooth the edge, just as I would add a Blend to a tradition part. In this case, I can select along the “sharp edge” and apply a smooth Transition along there, without needing to reverse engineer any precise geometry. When you move your companies designed over to NX from another CAD system, you face the challenge of how to deal with existing CAD data in the old system. Do you just let it go, treating it like the old racks of mylar or paper drawings that companies used to call their “legacy designs”? Do you save the data out to neutral formats like IGES, STEP, or JT or use a direct translator to salvage the BREP geometry from the part and make rely on Synchronous Technology for future design changes? Do you re-master the designs from scratch in NX, losing all the old engineering intent that might have been contained in the old files? What about the non-geometric information such as Assembly Structure? 3D to 2D drawing associativity? Attributes? Features? Parameters? If you leverage the Content Migration Manager from Siemens, you can bring all of that information, and more, from your legacy CAD system over to NX. So what are your thoughts? How would you rank these 8? Are there 8 other “brackets” you know of – maybe there’s really a Sweet Sixteen of brackets we should be voting on. So if your team is already out of the dance this year, you’ll have some extra time this March to learn some of these NX features that might be new to you. If your team is still in the dance, then congratulations and good luck – you can learn something new after you are done celebrating the next win!